The water fight was held in Hyde Park, but the crowd became hostile to police. The Serpentine in Hyde Park. TWO METROPOLITAN POLICE officers were injured last night after a water fight in Hyde Park got out of hand. 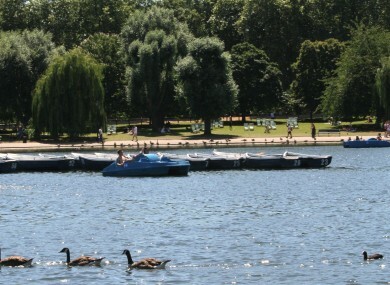 Hundreds of people had shown up at the Serpentine lake in the London park for a spontaneous water fight. However, around 8.40pm, police say the crowd became larger and “hostile” to officers. Two police officers suffered injuries in the incident – one stabbed and one hit by a bottle. Both were taken to hospital for treatment, with injuries described as not life threatening. Police are aware of two other people suffering stab wounds. Both have been taken to hospital. One has injuries described as not life threatening, an update on the second still awaits. Officers remained dealing with the incident until the crowds had been dispersed by around 2am this morning. Any witnesses or anyone with information regarding this incident is asked to call police in Westminster via 101. Email “Police officer stabbed and another hit with bottle after London water fight gets out of hand”. Feedback on “Police officer stabbed and another hit with bottle after London water fight gets out of hand”.